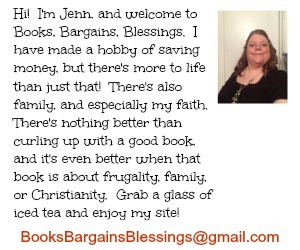 Books, Bargains, Blessings: How are you losing weight? I posted my weight loss on my Facebook status today. For those of you wondering, it's 14.6 pounds in the last five weeks. As expected, someone asked how I am doing "it". The bottom line is eating better and moving more, but I know that's not the answer they wanted, they wanted something a little more in depth. Today I'm going to talk about my morning routine and breakfast. I start on making breakfast. 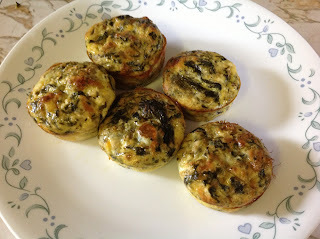 A few years back I found a crust-less quiche recipe that I have cut in half and often make for breakfast now. I take 1/4 cup milk, 3 eggs, spinach (it's low in calories, so I don't skimp on it) and a pinch of shredded cheese plus pepper and garlic powder. It tastes better with cheese baked in, but sometimes leave this out. I mix this together, pour in a silicone muffin pan which I have prepared with a non-stick spray. It bakes for 35 minutes at 380 degrees. The original recipe was a little different, and it called for 30 minutes at 375, but I like my food very cooked, and just this side of burnt. When I stick them in the oven depends on what exercise I'm doing that day. I really like Walk Away the Pounds, and if I'm doing Walk Away the Pounds (High Calorie Burn 2 Miles) then I'll stick the eggs in the oven right before I start because the two mile section on this takes approximately 30 minutes. (This morning I had five extra minutes before breakfast was ready.) If I'm doing Walk Away The Pounds Express 3 miles , I pause the DVD player after one mile, and stick the eggs in then, and once again, when I'm finished, breakfast is ready. Then I cut them in half, take a slice of 2% cheese and divide it among the 10 halves. (Again, it's not much cheese but the cheddar peps up the taste and only adds 45 calories!) Finally, I'm a West Virginia girl, so I grew up always eating ketchup on my eggs. When I went to college in Tennessee, some of my friends had NEVER heard of this. To cut down on calories, I have switched from ketchup to salsa. Plus it gives it added flavor. I love spicy food at any time, so this is a great substitution for me.